(ii) readily accessible for immediate use. While legally hunting, except within the limits of a municipality that prohibits hunting or on a highway. If you are 18-20, you may obtain a provisional concealed firearm permit. 53-5-704.5/HB198 (2017). 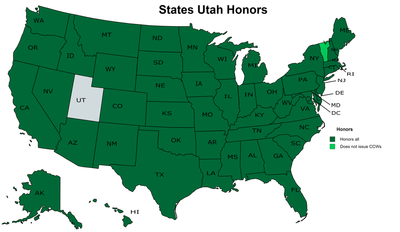 You do not need to be Utah resident to obtain a provisional permit, however the same requirements for holding an in-state permit, if your home state recognizes Utah's permit, applies (see below). Nevada will recognize this permit. Provisional permittees 18-20 may not carry in a public or private elementary or secondary school or on the grounds (53-5-710), but this does not apply to colleges (see 76-10-505). conviction of an offense in violation of Title 76, Chapter 10, Part 5, Weapons. contains an element of harm or injury directed to another person or another's property. Three years in the case of any other misdemeanor or infraction. Submit a photocopy or electronic copy of the nonresident applicant's current concealed firearm or concealed weapon permit. A practical exercise with a proficiency qualification course consisting of not less than 30 rounds and a required score of 80% or greater to pass. Can I carry a concealed handgun in a car without a permit? Yes. 76-10-504 and 76-10-505 do not not prohibit a person from carrying a concealed firearm, a loaded handgun or any unloaded firearm (including unloaded rifles and shotguns), in a vehicle in the person's lawful possession or with the consent of the individual who is lawfully in possession of the vehicle. The firearm may be concealed on your person. The 76-10-504 exemption to the permit requirement applies only to "in or on a place other" than the vehicles mentioned above, in addition to a person's residence, business, or private property. If the police detain me, do I have to tell them I have a gun? ​Although there is no legal requirement to identify yourself to a law enforcement officer, it is recommended to do so. If an officer finds or sees a gun on your person during their contact with you, and you have not identified yourself as a permit holder in legal possession of a firearm, the officer may assume you are carrying the gun illegally and may take defensive action. For the safety of all involved, it is recommended to immediately identify yourself to the officer as a permit holder in possession of a handgun. This action gives the officer some assurance they are most likely dealing with a law abiding citizen.